We’ve switched over to a wordpress.org format on the youngcraftersunite.com domain, so everything will look the same, but the RSS and e-mail feeds have changed. If you wouldn’t mind, please go there and you can add the new page to your blog reader, feed burner or you can subscribe to our blog via the feedburner box on the right. Since it’s only a week until we announce the fantabulous design team, I thought I would pop in today and introduce (or re-introduce, in most cases) someone that is very important to us here at YCU. His name is Simon! Yes, that’s right, Simon Says Stamp has very generously offered to sponsor our monthly challenges with a $25 gift certificate to their store. They’re awesome. I wouldn’t back up someone so full-heartedly unless I stood behind them, and every experience I’ve had with Simon Says is delightful (and so are the people that work there). Hope you’re looking forward to the challenge in two weeks. We can’t wait to share! Thanks again, Simon Says Stamp, for being an awesome sponsor. That’s right, monthly challenges for all of us young crafters (no matter in what way you’re young!) begin August 23rd. We’re working hard behind the scenes to assemble an awesome design team, secure some sponsorships and make everything awesome. For now, make sure you’re subscribed to the YCU blog (on the right side of the site, you can enter in your e-mail address to receive updates or you can add us to a reader with our RSS feed links). We’ll be back in the next couple of weeks with the announcement of and introduction to our design team. These young crafters are going to rock your socks off! Stay tuned for more updates as this awesome collaboration evolves. Young Crafters Unite Blog Hop Winners! The day that you’ve all been waiting for has finally arrived! 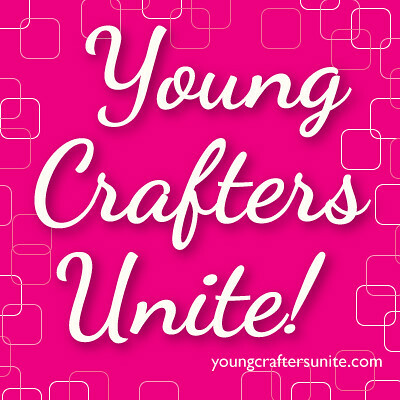 It’s time to announce the winners of our Young Crafters Unite blog hop. It’s our way of thanking you for participating in this event. It means so much to us, and we hope to do it again sometime soon! #14 Cathy Pulickal for her wonderful card with veggies and sunglasses! #25 Isha for her lovely tone-on-tone card with a sewing theme! #54 Efrat S. who has only been crafting for three months! #39 Danielle Daws who can seriously work some magic with colored pencils + mineral spirits! We will contact the winners within the next couple of hours to get the prizes out to you. If you don’t receive anything by the end of today, go ahead and drop us an e-mail at legojenta@hotmail.com or britta.swiderski@gmail.com. Thank you once again to our amazing sponsors. You guys rock! Make sure you check them out and send them love. :) Click on the icons to go to their websites. We are both featuring some of our favorite posts from the hop on our blogs today. Check out Marie’s blog and Britta’s blog today for some of our favorites! Really, it was so hard to pick out of all of the amazing entries, though. Everyone did such an amazing job, and we hope that everyone got lots of happy comments and new subscribers! We love you all and thank you so much much once again for participating. You’re definitely all winners in our eyes. :) We’re still in the process of figuring out what to do next with Young Crafters Unite, but we will let you know as soon as we have a plan, so don’t forget to add us to your RSS feed or subscribe to our posts via e-mail (look in the right side bar to do either of those things). Happy crafting, young creatives! Hi, crafters! What a weekend it was. Marie and I had such a fabulous time putting everything together and seeing it all come to life on the 1st. We hope you had a wonderful hop weekend as well! See you tomorrow for the winner announcements! 1. Make sure to leave a comment on each of our blogger’s posts to be entered to win one of the awesome prizes for hoppers. Comments will be randomly chosen via a random number generator, and three people will win a prize. A little birdie also told me that some bloggers may have their own giveaways on their blogs. All the more reason to leave a comment! 2. You have until Monday night (July 4th at 11:59 CST) to leave comments on each of the posts to be eligible for prizes. Winners will be announced on Wednesday, the 6th around noon CST (along with winners in the blogging category). Please leave only one comment on each blog post. 4. A huge, ginormous thanks goes out to our wonderful sponsors of this hop. Make sure to check them out and give them some love! 5. THANK YOU for making this hop possible. It’s every single person who views this page, blogs or hops along that makes this possible. We are so happy to have arranged this for you! If you encounter any issues along the hop (a dead link, a missing post, etc. ), please e-mail Marie or Britta (links in the sidebar) with your concern and we’ll try to solve the issue. So let’s get started. The first blog on your hop is the lovely Marie. Word on the street is that she has some videos for you!